From waterfront, break around to local food delight: 5 days exploring Vijayawada! What if I tell you to take a holiday trip in Vijayawada and come back all the way more victorious & richer? Well, the best part? 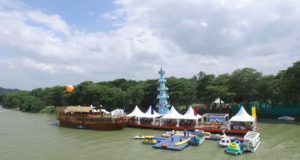 A series of sailing around with best enthralling water sports at the waterfront! If you are still not driven by the thirst of a serious case of wanderlust, I doubt, what will! Nestled peacefully on the banks of two great Rivers, the River Krishna & Budameru, Vijayawada is a city in Andhra Pradesh located about 5 km away from the Amravati, the state capital. Vijayawada is famous for its educational worth for students, the cultural heritage, trade & commercial business hub, agricultural richness, & a diverse historical glory known for preserving ancient ruins that makes the city a veritable paradise in itself. The city is surrounded by spectacular scenic hills full of lushness that offer an extensive selection of sightseeing spots to build out your travel itinerary. Apart from numerous caves & temples, Vijayawada is blessed with an enchanting beauty of lakes & River Island, forts, Buddhist artefacts that has paved the way of making it a favourite tourist spot especially for family vacations or romantic getaway! If you are worried about the accommodation part, thanks to tourism opportunities, you have ample choices of well-maintained hotels equipped with a variety of amenities that you can book without much ache to your pockets! So, pack your bags right away and embark on spotting on the best places of adventure & taking a tour in and around Vijayawada – wouldn’t that be a life? Count upon these experiences as you plan beforehand & let these experiences be your guide! Interest level: If you keep special interest in historical architecture or you are an ardent spiritual fanatic for historic & religious lessons, you are just at the right place! Just 6 km away south-west from Vijayawada, you will find the India’s ancient & medieval rock-cut architecture, “The Undavalli caves situated in Guntur district of Amravati region. A large volume of carvings abided by solid sandstone dated back to 4th & 5th century A.D. depicts sheer architectural skill to leave you spell bound. You will find a trail of Buddhist artefacts later converted to Hindu temples. The ancient Mogalarajapuram Cave is situated 11 km away from the city of Vijayawada and its formation dates back to 5th century A.D. The cave actually houses three temples that form the landmark of the rich cultural heritage of Vijayawada. One interesting fact about this cave is that it is assumed to be used by the Buddhist monks as the carvings of Buddha were later transformed into Hindu idols. Situated at a distance of 16 km away from the city of Vijayawada, the Kondapalli fort is just one hour drive away. Get schooled with the Reddy dynasty founded by Prolaya Vema Reddy, the builder of Kondapalli fort, who has built it close to his capital Kondaveedu. One intriguing feature of this fort is that the main entrance is made up of one single rock of granite while the other entrance known as the Golconda Darwaza serves as a gateway to the Jaggaiahpet Village. With time, the kingdom that was reined by many other successors turned into flourishing business centre. The main attraction of the fort is the crest known as Tanisha Mahal or Palace. Apart from these, the inside of the fort features the Rani Mahal, the Dancing hall & the Arched hall. You will also find a reservoir & several other ruins inside the fort. Tip: If you love light weight colourful wooden toys or other handicrafts, this is your chance to pick your favourite one as the Jaggaiahpet Village is famous for handicrafts. Located in Bandar road, Vijayawada, this archaeological museum was established in the year 1887 which is famous for its interesting collection of artefacts & sculptures. One major tourist attraction for is the colossal black granite statue of Lord Buddha that dates back to 3rd and 4th century A.D and has been well-preserved since ages by the government. Built in an Indo-European style architectural framework, the museum displays a huge number of ancient idols, sculptures, stones, pottery, tools, inscriptions, cutlery, weapons, coins, metal works & paintings. Situated along the bank of Krishna River, you can visit the famous shrine of Kanaka Durga. To reach there, drive up to the Indrakeeladri hills amidst the serenity to find the temple precisely built in the fashion of ancient Dravidian architecture. Known for one of the 108 famous shakthipeethas, the idol is one unforgettable sight to behold for the devotees. If you are lucky enough to visit the temple in the month of September, don’t miss the opportunity to seek the Goddess blessings on the nine days revelries of Dasara Sharan Navarathri celebrated every year with great pomp and gaiety. Apart from the above mentioned places of interest, the Subramanya Swamy Temple (4 km from Vijayawada), Hinkar Thirtha (20 km from the city), Gunadala Matha Shrine (1 km away from city-centre) are a must-to-visit places that adds up to the main attractions of Vijayawada. Interest level: For those who are nature lovers, Vijayawada is an interesting retreat away from the hustle and bustle of the city into the lap of tranquillity & nature. Experience the freshness of delightful evening visiting the Rajiv Gandhi Park, situated at the entrance of the city. The Park is a gateway to the city of Vijayawada that welcomes its visitors with greeting of horticultural network & recreations that includes awe-inspiring trees, attractive flowers, lush green lawn & sidewalks. You can also learn some awesome facts about the animals belonging to pre-historic ages from the replicas put up at the park. Also make sure you catch the bedazzling live musical fountain show that secures a favourite spot for the young & the old. When you have come a long way to Vijayawada, why wait more for some real-time city shopping? You gotta go straight to the Besant Road to try out the local delights & colourful handicrafts that you can buy as home gifts for your close ones. Here you can find a multitude of shops that sells handwoven Mangalagirisarees with colourful intricate designs to take your pick! And for some serious pickle lovers- time to grab your favourite mouth-watering local mango pickle-Avakkai, a local delightful tongue teaser prepared by locale experts! So now, would you still advocate for online shopping? For all nature & water lovers, explore some of the best family-friendly Islands & some serious water sports adventures in Vijayawada – so untouched & peaceful with absolute privacy, that you won’t find it elsewhere! It ain’t a holiday without some serious fun & relaxation on Island…and the best choice is the Bhavani Island. Located in the midst of the Krishna River is the Bhavani Island is just 4 kms away from the city and needs no introduction. 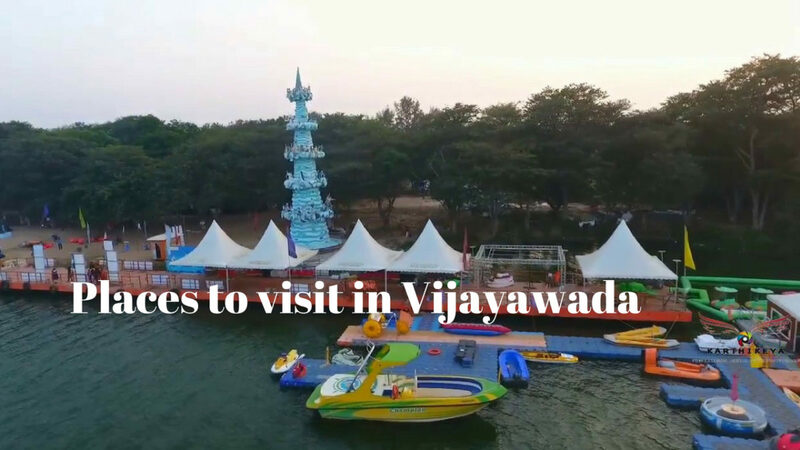 This is one of the favourite Islands for visitors & the largest Island in Vijayawada, ideal for private picnics as it is surrounded by mangroves & well-maintained gardens. You can just laze around, play, eat, enjoy or simply relax along the pristine Island-your choice! You can also jett-off to the Island for an awesome sailing experience and in return you get to enjoy an overseas feeling, the vibes that gets you instantly connected to the place. Built across the Krishna River at the outskirts of Vijayawada, sited the huge Prakasam Barrage. This is mainly a road bridge that associates three water supply canals to facilitate water passage to the thermal plant station. Mainly used an irrigation project, this bridge on the Krishna River offers an excellent panoramic view & the delightful breeze during evening decked with colourful lightings at night. The place is also an all-inclusive adventure zone where you can explore exciting water sport activities such as boating, water scooting and parasailing. And for selfie-lovers & photo fanatics, it’s bliss to capture some great private moments as well as photos of some rare species of migratory birds if you are lucky enough to spot them from the barrage. Interest level: If you are a foody, find the soul in delightful lip-smacking local Andhra flavour waiting for you to taste & try. 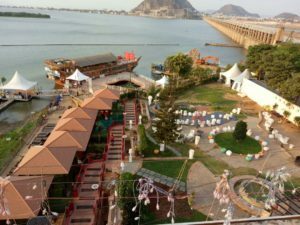 The best part about this restaurant is delicious contemporary cuisines served at the waterfront sit out set-up, located just beside the Krishna River, across the Prakasam Barrage. If you are visiting Vijayawada, it’s a sin to miss out the lip-smacking spiciest Andhra biriyani, tangy taste of curries and the chilly- tangy combo of snacks & semi- gravy delicacies. If you are a vegetarian, the tangy Mughal flavours of vegetarian thali are an ultimate vegetarian delight. Relish it & thank us later! Also not-to-miss local items such as Chepala pulusu, Royyala iguru, Jinga masala, Pachadi, Kodi vepudu, Lasooni machi tikka, Minapappu(Laddu made from roasted Urad dal) , Nellore Chicken Biriyani, appu Koora (Lentil based dish) and many more delicacies within the menu! Enjoy the meal coupled with LIVE music. It’s indeed, phenomenal! The speciality of this coffee shop is the authentic steaming filter coffee to enjoy. This is an exclusive vegetarian cuisine restaurant with a huge fan base since ages. Relish the taste of the authentic steaming filter coffee that surpasses the taste of any contemporary coffee shop. The restaurant also serves sumptuous food for its patrons. If you are looking to try out delicious top-notch dosas & grab some quick delicious snacks, this is where you will find it! Ah! Sweet magic? What’s so sweet about it? But it’s more than a name! Originally started as a traditional sweet store in Vijayawada, it has spanned across the city with many outlets to include traditional local cuisine of the regions. For Biriyani lovers, this is an absolute Biriyani paradise with 15 varieties of Biriyanis to try out! Yummy! Day 5: Nightlife partying at the waterfront. Have party in mind while you are in Vijayawada? 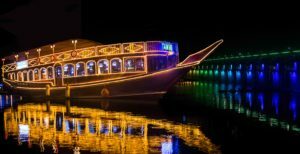 Time to try out this luxury floating restaurant-Tanvi River Cruise, the floating platform that makes up for an extraordinary venue for group partying! Yes, on the waterfront side! 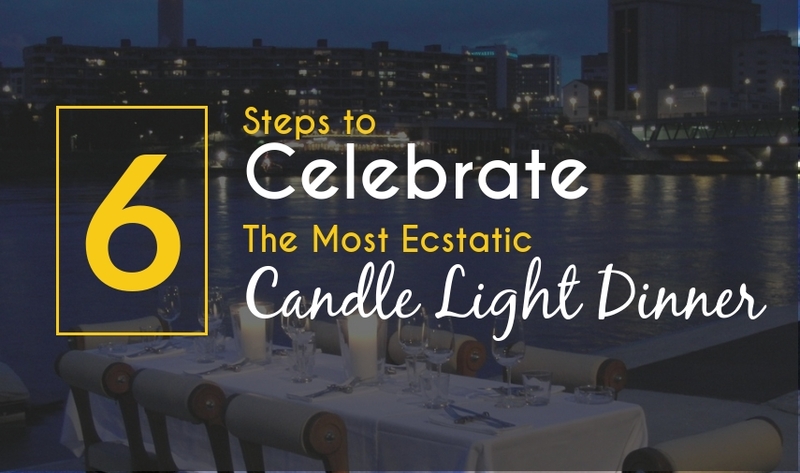 Get into the party mode with an ultimate waterfront party and dining adventure. The waterfront party cruising offers its patrons a whole new level while cruising along the magnificent Krishna River waterfront. Chill out sipping delectable flavours of drinks, munching snacks & dancing on the beats of foot-tapping live music. Cap off the magic of the night vibe on floating cruise! For on-ground party lovers, Vijayawada offers real party entertainment to the youths. Head on to the “10 Downing Street” party pub with your friends where you can party with non-stop rocking music and dance the night away. Keep Partying hard! With so many flavours to try out and experience, do you still need a reason to visit Vijayawada for this holiday rendezvous? Get it all covered! 7 Point checklists to consider before you buy a Boat & Yacht! “If you have fallen in love with boats, you definitely should own one”. Now that you are thinking of buying your private dream Boat or Yacht, you must be pondering over the questions that you have in mind? There are many who own a boat but are not happy owners. So, it’s better to look before you leap rather than crying over a wrong boat purchase. So before you buy, ponder on a thousand questions; take into account a number of factors that can help you land upon a final decision. There might be tonnes of advices brewing up in the digital space the moment you search upon a checklist to consider while buying a boat. But believe me! You don’t necessarily need to follow these advices if you understand what the buying benchmarks actually involve. When it comes to buying a new boat, you definitely need to be more self-evaluative and predictive while choosing the boat type you want. Jet ski, wakeboard, luxury yacht, seasonal boat, speed boat- any boat type you choose, you should also consider the purpose, whether for private usage or hire, the purchase process, budgeting, period of usage, condition, stabilization, maintenance, electronic suite fit etc. – everything detailed out in a check book in hand when you step into the shopping marketplace. Take a look at these 10 point checklists that might be useful while choosing the right boat for you. Where shall I start with? Once you are all set for some serious boat shopping, the best place to start is searching online. You can access variant models, types, features and benefits. Take a 360 degree virtual tour, search by length, colour or model name perching on your chair right from home. You can even customize the kind of boat you want as per the availability & location. Which type of boat shall I buy? This depends upon how you will enjoy the boat. Is it for your passion & entertainment, private family vacation or adventure sports? Each boat comes with a distinct specialization & compatibility with the engine suite fit, diverse nuts & bolts. Each boat idealizes a specific usage such as a boat with open cockpit is ideal for fishing while a floating dock can be an excellent moving party cruiser for weekends in marinas. So it’s better to make a thorough check. Do I have the convenience to go to waters anytime with ready-to take-off cruiser? This is an important deciding factor as a lot depends upon your ease of timing to cruise upon. Do you have enough time to cruise? Or you are okay with simply paying off the docking charges even if you are not in town? Will you embark upon a voyage on choppy waters? Are you a day-time cruiser or you mostly prefer nights for sailing? As my budget is fixed, how do I decide upon boat features that will fit to my taste and personal usage? It’s always a wise investment to go by sailing opportunities of your boat that you will purchase. The right boat can earn you a multitude of entertainment on waters via fishing, ski, tube, family union party and much more. Also, going by tight budget constraints, keep approximately 60% of the budget for the purchase; while the rest 40% as saving for serving related costs. What is the passenger capacity & top speed of the boat? One necessary step to consider before you purchase is testing the vessel on waters. It’s obvious you won’t like to settle even if the seller of the boat authenticates it as “runs good”. This won’t satisfy you, right? Instead, go for a test drive with your family. Check the throttle and their positioning as you manoeuvre. Does it take smooth turns at all speeds? Check for the boat load capacity when it is high on speed as well as at idle speed. Check for the boat feel, sound and performance. Should I purchase a new one or a used boat? A lot of high quality used boats are available at much reasonable rates or as much as at the same cost of brand new boats. While you are opting for the older one, a lot of hidden problems should be taken into account. Check for common issues such as engine conditions, electrical systems, bilge pumps, detection of saturated foam in the hull, cabin leaks etc. that can turn out to be life-threatening if ignored during inspection. Even if you chose a brand new one, make sure you test it on waters and enjoy the warranty that comes along with it. Shall I get package deal with the purchase? The type of the boat you buy and if it is a new or old will determine the deal and the package stuffs included within. You can receive the equipment list from the seller that will include all the amenities and accessories within. These 7 points checklists are not enough. There are more aspects of the boat that are uniquely different and the way they behave on waters. Finding your perfect dream boat needs a thorough research and prompt scrutiny of all the pros and cons along with the important determinants that will work the best for you. Else it can ruin your happy weekend holidays and turn out to be a sea of trouble for you. Valentine’s Day Craze is not over yet! 10 events to plan next on waters! The Valentine’s Day is all over! But won’t it be unfair if you think it’s just a one-day-celebration affair? You still have 364 more days to switch things up. Ah! The sour and sweet taste of love; the craze of romance as when most lovers would agree seems unquenchable. So why define love by translating all your sentiments in just one date when your love calendar can go far beyond? After all, love is not measured by mere pack of chocolates, bouquet of roses or any expensive gift you plan throughout these 7 days in the Valentine’s Day basket! That sweet and tingling feeling, that passionate revelation from the bottom of your heart is an expression of each single day and at all seasons. So, forget clichéd Valentine’s Day celebrations and try something different this year. Leaving aside these fancy & expensive gifts, here is a list of provocative points that can help you in love celebrations the entire love season! Steal a glance. Sometimes an uninterrupted time together counts more than a gift. Ignite your love once again cruising aboard the yacht with your loved one. The mesmerizing scenic views surrounded by wild greens are purely breath-taking. One of the favourites is the exotic daily Champions cruises in Goa. They offer best luxury cruise packages that will surely present a good chance to woo your partner – well, it actually matters! How about a dolphin sunset cruise on the Valentine’s season that takes the two of you through the Dolphin Island? If you are lucky enough, you can spot a few bottlenose dolphins or even some of the acrobatic skills by these smart lovely water creatures. Also lookout for diverse species of birds around that soars high up in the sky – a memorable adventure that will surely sizzle up fun, romance and excitement! Propose your love once again – this time, with an open invitation to explore the galactic waters of pristine island. This is a perfect moment to mingle – just the two of you! This is a day just for you and your love. 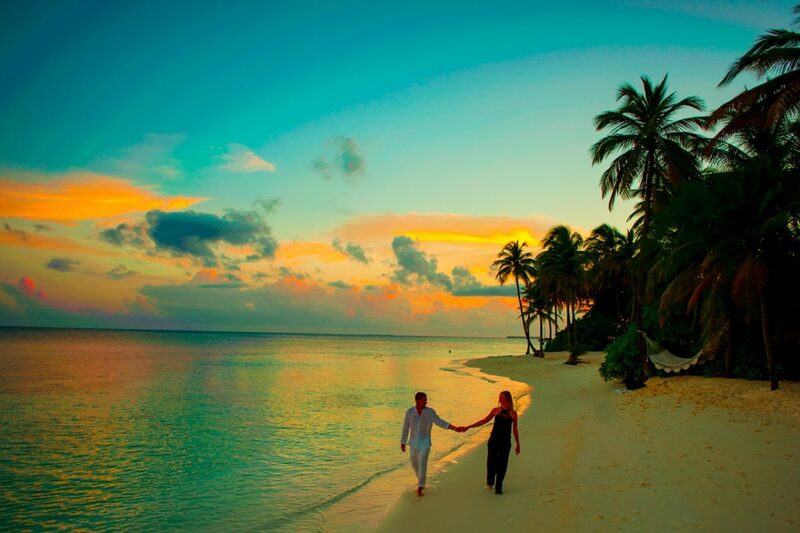 Don’t forget to explore the spells of romance while relaxing on the romantic beach-side, hopping on romantic catamaran tour, or roaming aimlessly across the beach, hand-in-hand with your love. Also nothing is as romantic when you are in a fun fishing date with partner. Well, it’s a game of trials! The soundtrack of waters crashing against each other while in between hooking some colourful fishes amidst romantic sunset or sunrise on waters is divinely romantic! Capture these wonderful memories; cherish them later! Outdoorsy couples! For valentine’s escape, predictive getaway is a mainstream, but what if your experience starts off with luxury romantic overnight stay-on-yacht? Wow! A quality time with your sweetheart begins with special Valentine’s intimate dinner & cocktails for two, complimentary Catamaran sailing experience and some classic boat rides. And a special Honeymoon suite to whisk your love with glamour and romance – nothing counts more romantic than this! A Valentine’s menu with a glass of champagne for couples nestled around the waters is a romantic surprise for your love. Plan a lovely-dovey day at this Cupid’s water corner, perched cosily on a romantic dinner date with your sweetheart. The spectacular sunset trailed by a set-delectable menu is love-inspired! It is meant to be relished under the stars above the roof-top deck that spells a love story by itself. Enjoy the difference! Love the need for speed? Now, experience this as couple on waters. Celebrate crazy moments with some interesting water adventures such as Jet Ski, Paragliding or skydiving. Showing off love to your special one braving the high sea waters is something that will definitely add flavour to your taste of celebrations. Hit the water sports with your lover. Also try out a whole spectrum of activities that includes kayaking, paddling, banana boat ride, speed boat and many more. Scuba diving in pair – Turn up your romance! With skin tight wetsuits, turn up your love under water; this time with the most addictive pastime – Scuba diving (lasting for 30 minutes). As lovebirds, try this special bonding experience. Explore this euphoric experience of balancing your breath being in the moment while you spot intelligent friendly aliens into the beautiful marine world such as colourful corals, butterfly fish, seahorses, trigger fish and much more. Not to forget to capture these right moments with wide-angled under water photos with your love. Looking for a crowd pleasing dancing platform? Try something different with an upper deck DJ platform on floating cruise. Dance your way out with your lover on the floating DJ music & dance platform. Start off with cheesy LIVE music beats. Lead your partner’s steps with ballad, cha-cha, tango, salsa or local dance that can set your mood for the rest of the night. Take your loved one out over the placid waters under the stars for viewing an open-air cinema – it’s an absolute romance on waters! Lavish your date with one of the classic vessels aboard the yacht. Experience the vibe of an incredible setting as you cosy up with your sweetheart on sophisticated floating lounge with river lagoon is at the backdrop. You will be enticed with special food & beverage experience that will simply make your day. 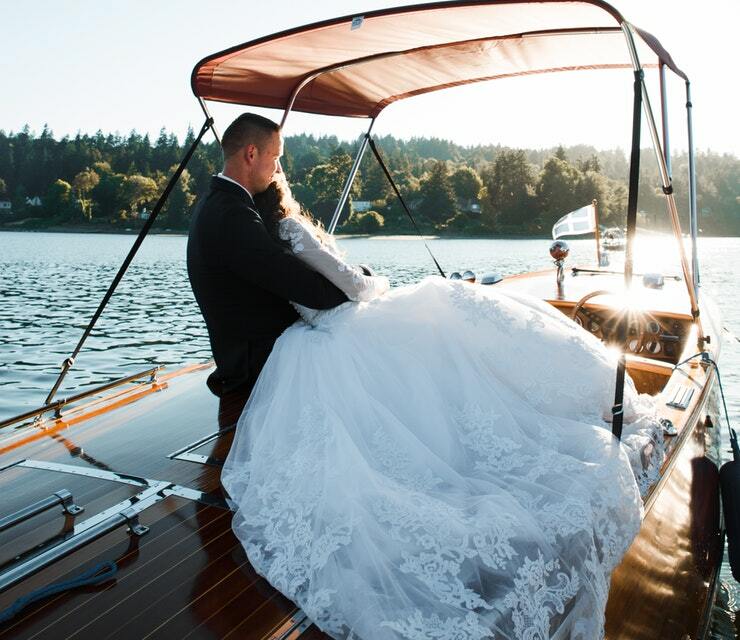 Nothing beats this electrifying romance on waters! Isn’t it tempting? This list promises an obvious romantic, yet magical experiences to evoke for love birds and are paired with the most elite, yet unique celebrations. So couples! Let your imaginations fly and heart flutter with Luxury Cruise packages in Goa, best customized by you this evergreen Valentine’s season.